1 channel flush control box. Built in purge control to avoid stagmentation. 35 second delay between operation. Ideal to work with the electrical syphon flush conversion CSL0985. CSL0983A (Tactile Button), CSL0983B (Wave On Button), CSL0983C (Piezo) compatible. 2 channel tap control box. Adjustable run time from 6 to 20 seconds. Lockout facility to help prevent flooding. Works with electrically operated stainless steel recessed hand rinses and washbasins. 2 channel shower control box. Adjustable run time from 30 to 180 seconds. Ideal to work with our electrically operated showers. 1 x Flush controller built in (1 to 6 seconds programmable). 2 x Tap controller built in (10 to 19 seconds programmable). 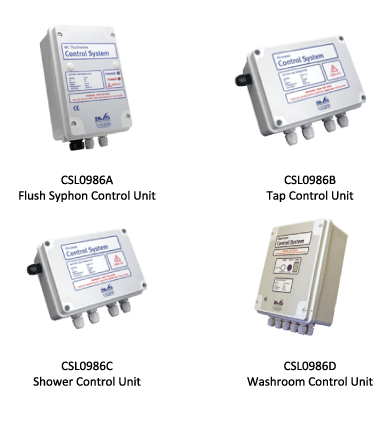 1 x Shower controller built in (60 to 180 seconds programmable). Ideal for use with the Cell Security electronic stainless steel sanitary ware range. Built in purge control to avoid stagmentation on each channel. Lockout facility on each channel.